EDAP TMS SA (Nasdaq:EDAP), the global leader in therapeutic ultrasound, today announced the results of a multicentric study using Ablatherm Robotic HIFU which demonstrates promising oncologic outcomes with low side effects. The results of the study have been electronically published in the prestigious peer-reviewed medical journal European Urology; the study will subsequently appear in a print edition. 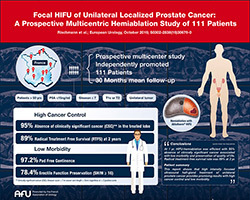 The prospective, independent, multi-institutional study conducted by the French Urological Association (AFU) was designed to evaluate HIFU hemiablation (treatment of the half of the prostate where the tumor is located, sparing the rest of the gland) as a primary treatment for localized, unilateral prostate cancer. In the study, 111 patients received focal hemiablation using EDAP's Ablatherm® Robotic HIFU at 10 different clinical institutions. Control biopsies were performed 1 year following treatment, with 95% of subjects showing absence of clinically significant cancer on the treated side. The study also showed very low side effects with continence preserved in 97% of patients at 1 year and erectile function preserved in 78% of patients. There was no significant decrease in Quality of Life score observed at 12 months, and the rate of radical treatment free survival at 2 years was 89%, meaning that only 11% of patients underwent surgery or radiotherapy. Pascal Rischmann, Chairman of the Department of Urology, kidney transplantation and Andrology, University Hospital of Rangueil in Toulouse, France at the time of the study, and lead author on the study said, "This study supported by the French Association of Urology builds upon the interest in focal therapy and demonstrates its role in the management of prostate cancer based on quality of life preservation and efficacy. I have long thought HIFU was an ideal ablation modality for focal therapy and this is substantiated by the study results." Marc Oczachowski, Chief Executive Officer of EDAP TMS, added: "This focal HIFU study and its promising clinical outcomes confirms HIFU as a true alternative for select patients diagnosed with prostate malignancy. When these patients wish to avoid radical surgery or radiotherapy but feel uncomfortable just "watching and waiting" for the development of their disease, HIFU with a partial-ablation approach seems to be a good compromise between these two extreme options. This is a real opportunity for EDAP's superior HIFU technology."